Check your phone. Your animal friends are calling. 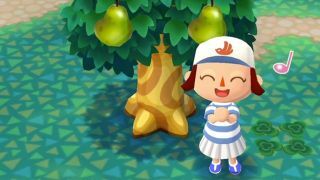 A month after announcing Animal Crossing: Pocket Camp for iOS and Android, Nintendo has finally set it free around the world (not just Australia like before). I have it downloaded to my iPhone right now, though I haven't really started playing yet because I don't want to get sucked into shaking fruit trees and talking to dog people all day. If you're going to surreptitiously download the app at work or school, lemme warn you right now that the game will also require an additional 99mb download on top of the regular app install before you can start playing, at least on iOS. So you'd better account for that in your friendly animal escape plan. Also, it looks like Nintendo's servers are being hit pretty hard at the moment; I only managed to sign in after receiving multiple "communication error" messages. Not sure what the deal is? Animal Crossing: Pocket Camp is pretty much a miniature version of the slice-of-life Animal Crossing games, though this time you're also in charge of your own little campsite. The individual items and larger amenities you choose to construct will dictate what kind of animals come to your camp. By doing favors for those animals and becoming friends with them, you can earn resources to build more stuff, and the cycle continues. Unlike Super Mario Run, Animal Crossing: Pocket Camp is a free-to-play game - or to use Nintendo's nomenclature, "free to start". You can buy and use "Leaf Tickets" to accelerate countdown clocks and purchase other in-game conveniences. Pocket Camp will also reward you Leaf Tickets for leveling up or completing certain in-game goals, so dedicated players should be able to get by without spending much (if anything) on microtransactions. For more mobile fun, check out our list of the best iPhone games. Or if you're a big Nintendo fan, see if you're missing anything from our list of the best Switch games.